"Moonlit Campsite - New Year's Eve 2009"
Well, my trip is nearly over... almost 6 weeks ago I left Grand Portage on a quest to explore the West, focusing mostly on the Pacific coastal areas of Washington and Oregon. Its been a great trip, but some of the best experiences were at the end of the trip! 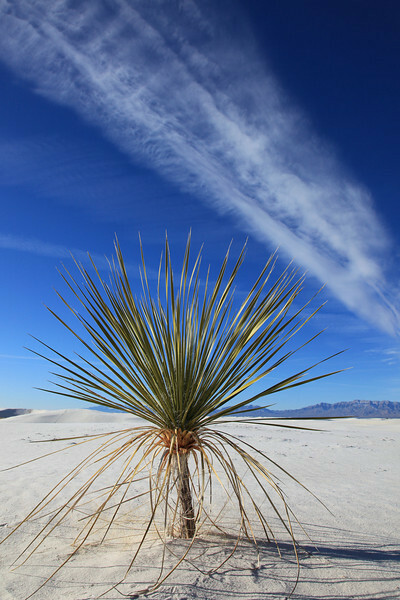 My friend Roger and I arrived at White Sands National Monument in New Mexico the afternoon of December 31, 2009. We were planning on camping overnight in the dunes and arrived at the park just in time to get our orientation and register for our campsite before the daily deadline. After we registered, we had just enough time to scope out a place to shoot sunset and the moonrise. 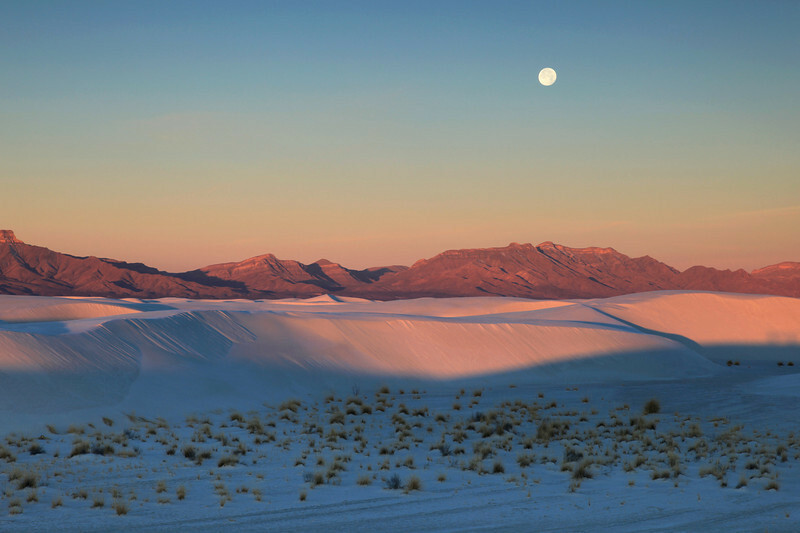 Watching the moon come up over the white sand dunes was incredible. After shooting the sunset and the moonrise we decided to set up camp before doing some moonlight shooting. Our campsite was about a mile from the parking area and after finally locating our site (which was a little difficult to find, since the trail markers through the dunes are VERY difficult to locate in the moonlight! ), we set out for a few hours of moonlight shooting. 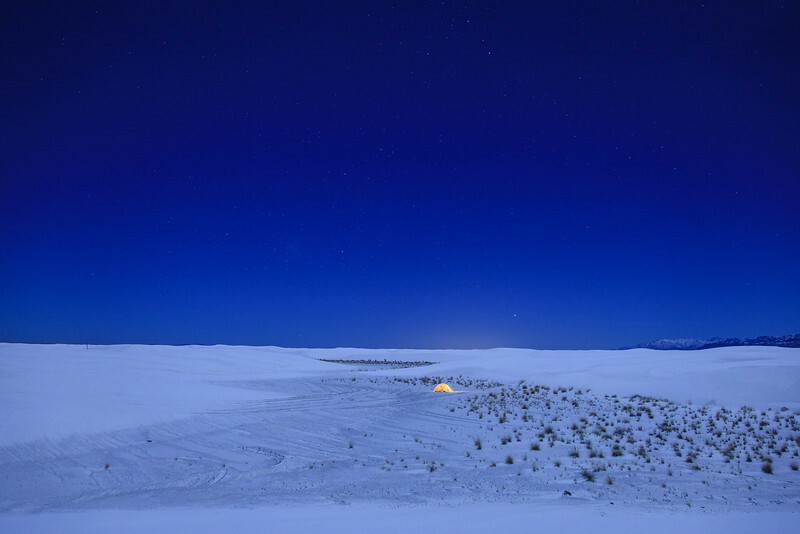 "Moonlit campsite in the dunes - New Year's Eve 2009"
White Sands is an awesome landscape during the day, but switch to night and throw in the light from a full moon and its downright magical! We had a blast hiking around the dunes and taking pictures. It was a lovely night, the air was crisp but not too cold and there wasn't a lick of wind. Its pretty amazing when its so still and you can't hear anything except for your own breathing. Thule (Roger's dog) even seemed to really enjoy the night as he was friskier than usual, running laps around us and jumping up and down. "Sunrise Camp, New Year's Day 2010"
My alarm woke me at 6:30, and when I crawled out of the tent I noticed right away that it was much colder than it was when we went to sleep. In fact, our tent was even covered in a thin layer of frost! I don't know what the temperature actually was, but it felt like it was in the mid 20's. As I crawled out of the tent I turned my eyes skyward and the first thing I saw was the full moon just above the dunes directly out in front of the tent. What a sight to wake up to! 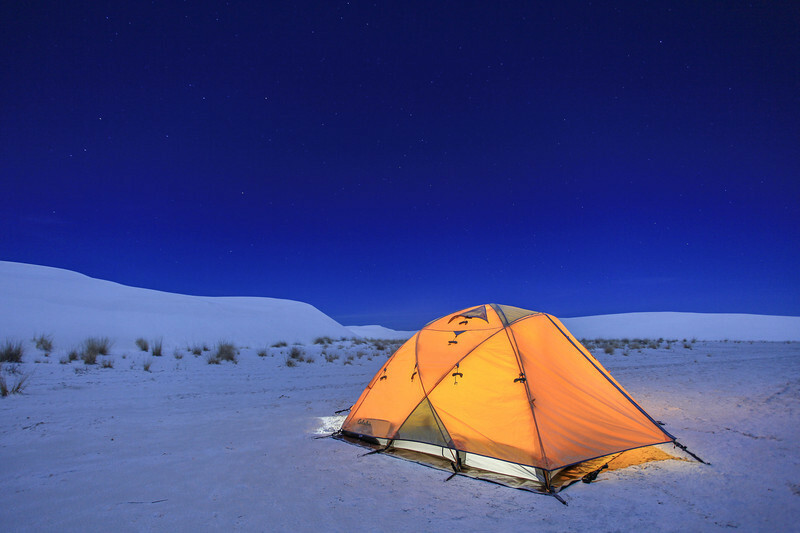 I quickly forgot about how cold I was and went back into the tent to wake Roger and retrieve my camera gear. "Sunrise Moon, New Year's Day 2010"
As the sun got closer and closer to breaking the horizon, the sky to the West took on this amazing pink glow. The pink sky with the moon and the white sand made a view that was to die for. Definitely one of the prettiest New Year's Day mornings I have ever seen! 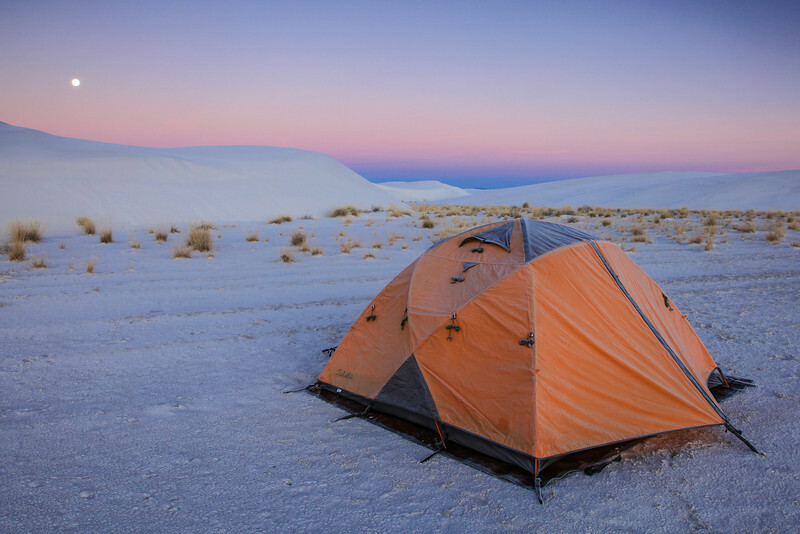 After our night of camping at White Sands, my friend Roger and I also spent the whole day exploring the dunes. 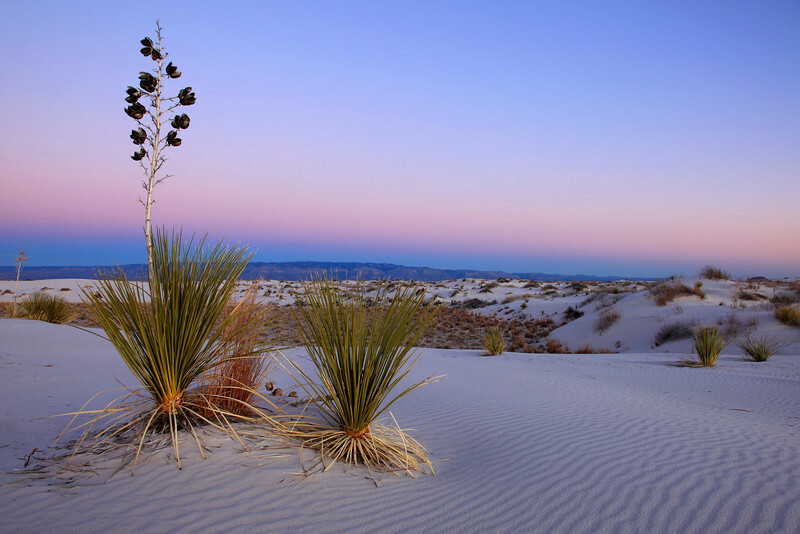 White Sands is such a unique environment... this is my 3rd visit to this amazing place and I doubt it will be my last. 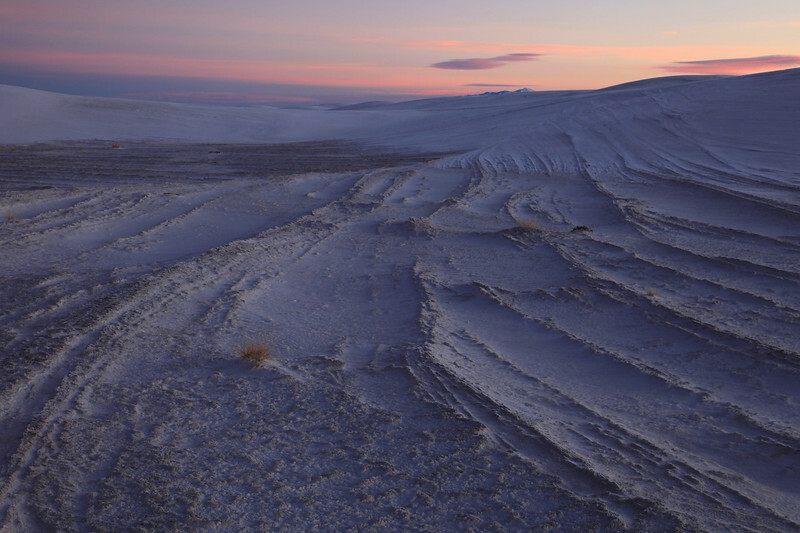 It was such a thrill to watch the light change as the sun rose higher over the dunes. The sky went from shades of pink to a rich, deep blue. One of the challenges we had during this visit to the dunes was finding areas of the dunes that were untouched by footprints. 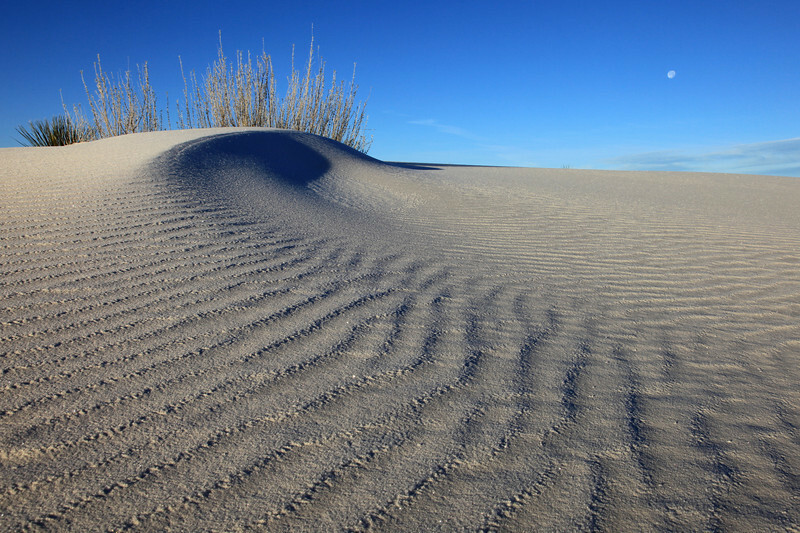 Due to some recent snow and rain that had fallen, there was some moisture in the ground and thanks to the colder temperatures the dunes were actually kind of hard and not the soft, loose sand that is normally found here. 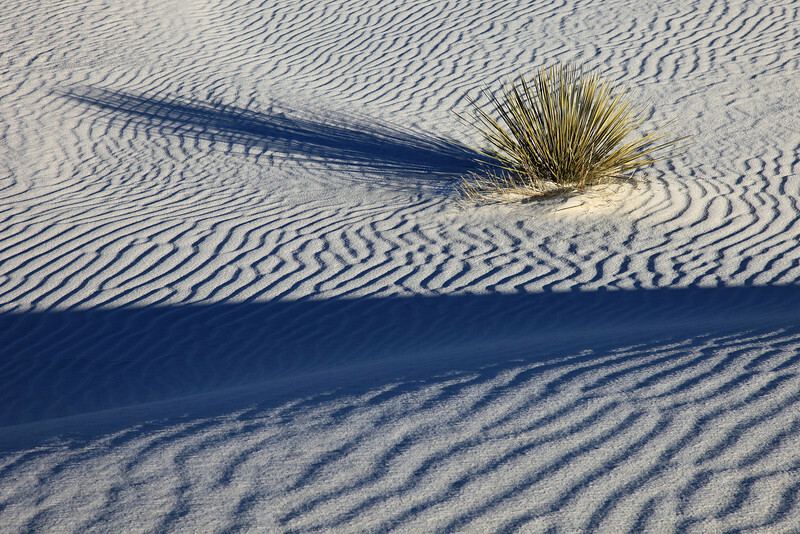 Because the sand was somewhat hard, footprints were not being erased as quickly as they normally would be by the wind. As such, there were many more footprints than you normally see here which made finding a "pristine" dune quite difficult. After a bit of hiking and exploring, we were able to finally find some areas that had not seen any recent traffic. It doesn't take very long to get a sun tan while hiking amongst the dunes. With such a bright, reflective surface the sunlight actually bounces up from the ground and in a way you are being bombarded twice by the same amount of sunlight. After only a few hours of hiking in the dunes, our faces were starting to get red. Thankfully, though, this time of year the days are pretty short and before long the sun was getting low in the sky and once again it was time to seek out a location for sunset. 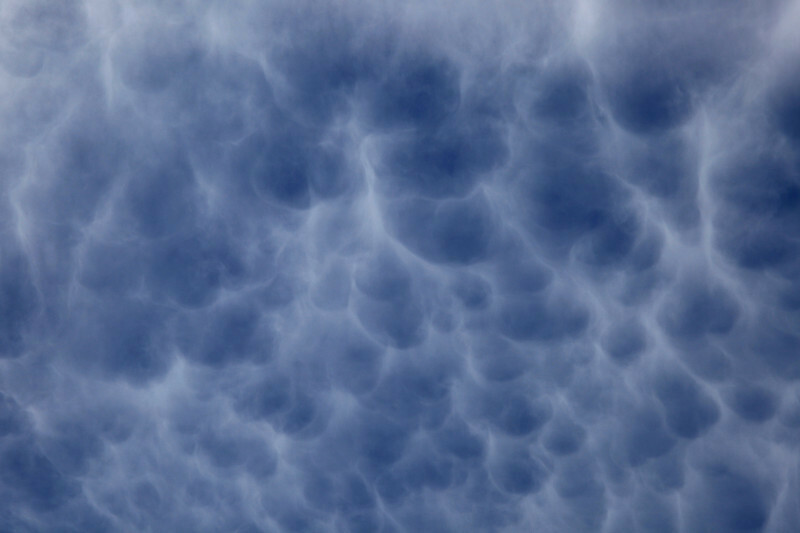 I don't know if these are technically mammatus clouds or not, but they sure looked like them to me. I call them "Cloud Bubbles". After a bit more searching we found another spot in the dunes that was relatively untouched by foot traffic. 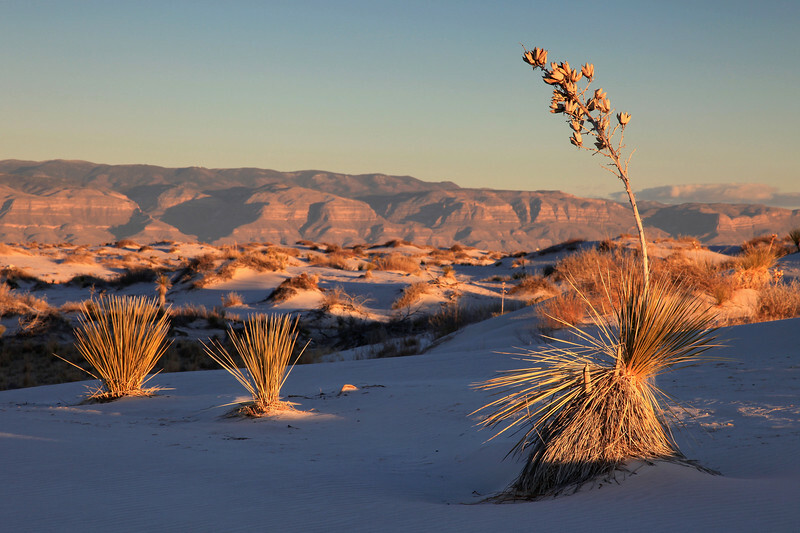 We each looked for some nice Yucca plants that we could frame in our shots and soon the last of the sunlight was working its way up the length of the Yuccas. Before we knew it the sun was below the horizon and we were once again treated to a beautiful pink glow in the sky. This place is so amazing during the dawn and dusk times of the day! Truly one of the most unique natural treasures in this world... I can't wait for my next visit! Since returning in early January from my trip out West, I really haven't been out with the camera much. I guess I took so many pictures on the trip that I needed a break from the camera for a while. I have been out a few times, but haven't taken very many images. One exception was an afternoon in late January, when I took a walk out along Artist Point in Grand Marais. Artist Point is always a nice place to take a walk, but in the winter it can be especially beautiful. For one thing, on a day where the air temperature is right around zero degrees and there is a 20 mph wind out of the North, odds are you'll be the only one out there! In the winter, waves and spray from Lake Superior combined with the frigid air helps turn Artist Point into an icy paradise. 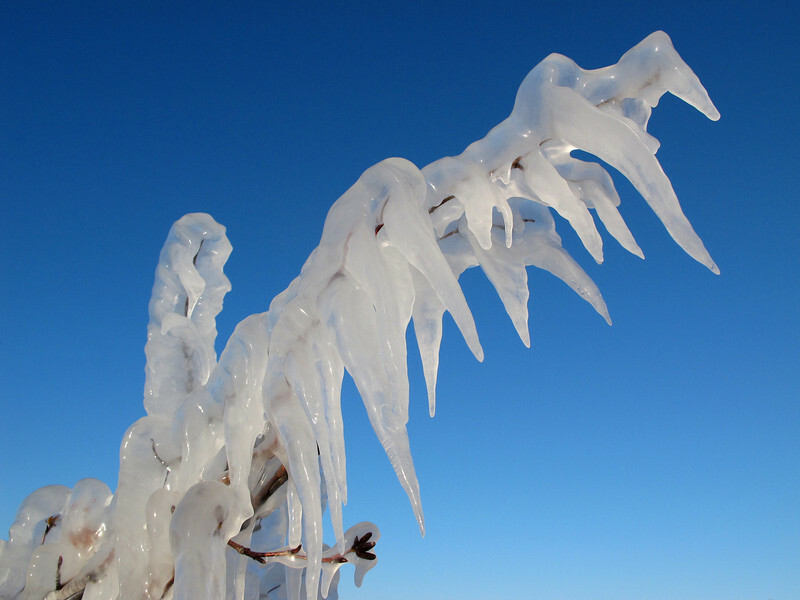 One thing is for sure, you need to be very careful when hiking anywhere along the Lake Superior shoreline in the winter! With ice coating almost every inch of the ground, each step carries with it the potential for a dangerous tumble! Careful steps, though, reward one with some incredible sights. 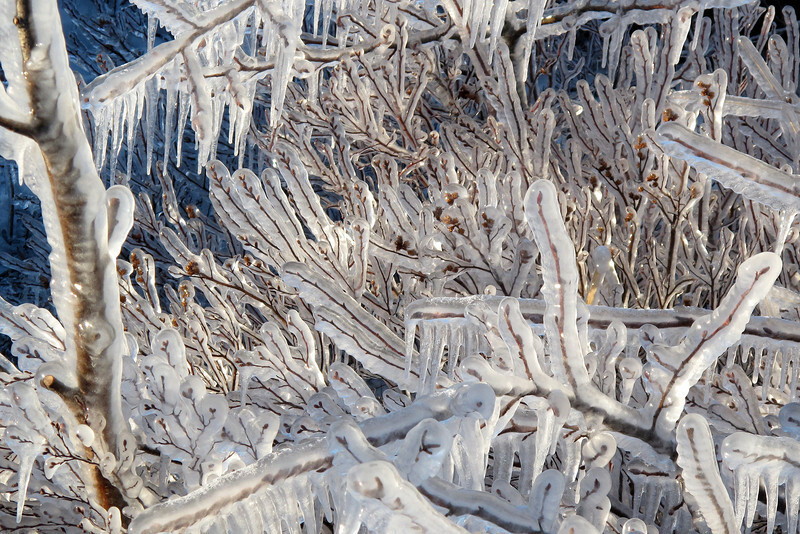 As I walked the loop trail around the point and along the harbor breakwall, the bushes and shrubs along the way were encased in ice. Each rock was covered in a thin layer of ice as well, with endless varieties of patterns and designs in the surface of the ice. I could have easily spent the remainder of the day out along Artist Point, but the brutal wind chill soon forced me back to my warm car. 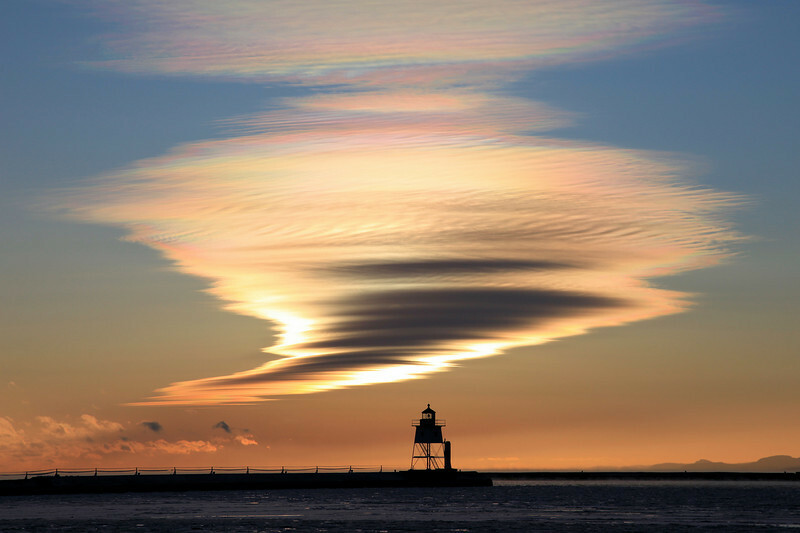 "Tornado Cloud, Grand Marais Harbor"
After my walk on Artist Point this incredible cloud was hanging over the lighthouse, the sun hiding behind it. 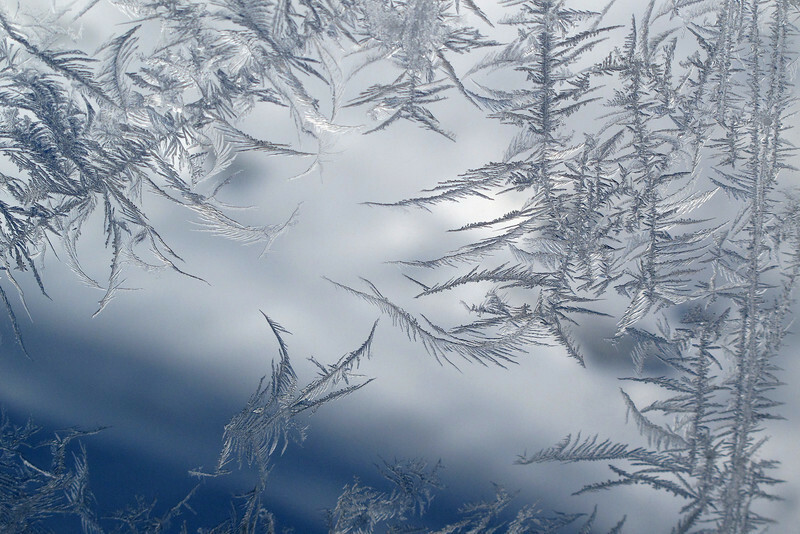 I call this "Tornado Cloud"
Sometimes, frost patterns on windows can be mesmerizing! A few miles inland from the lake, the scene was completely different. 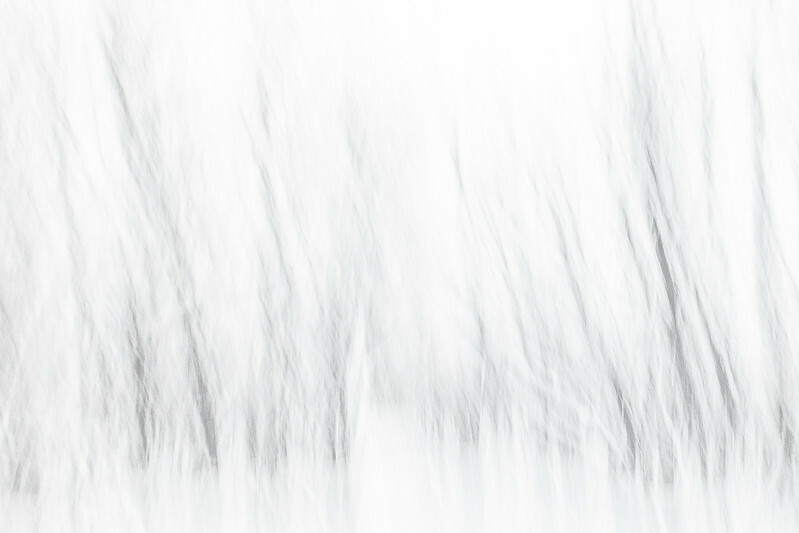 Thanks to a recent winter storm that gave us wet snow combined with rapidly dropping temperatures, the forest was covered in a blanket of snow that had literally frozen to the trees as it fell. 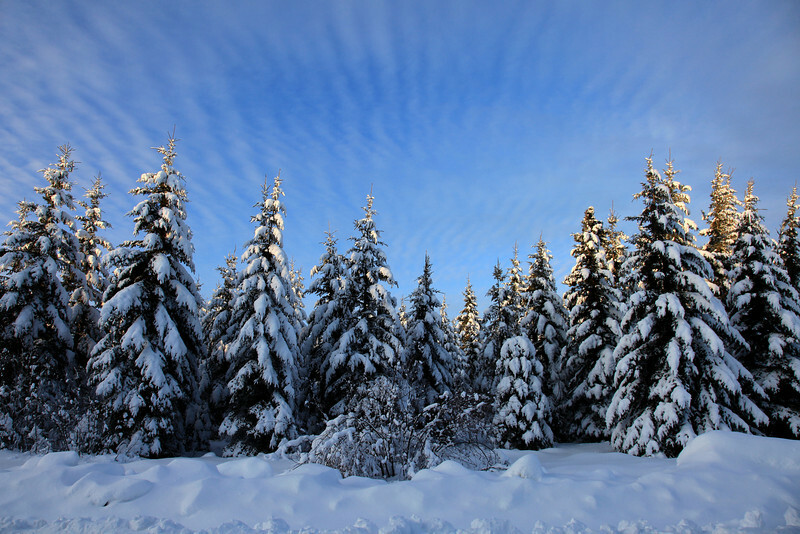 Winter may be the harshest season in the north woods, but in many ways it is also the most beautiful. 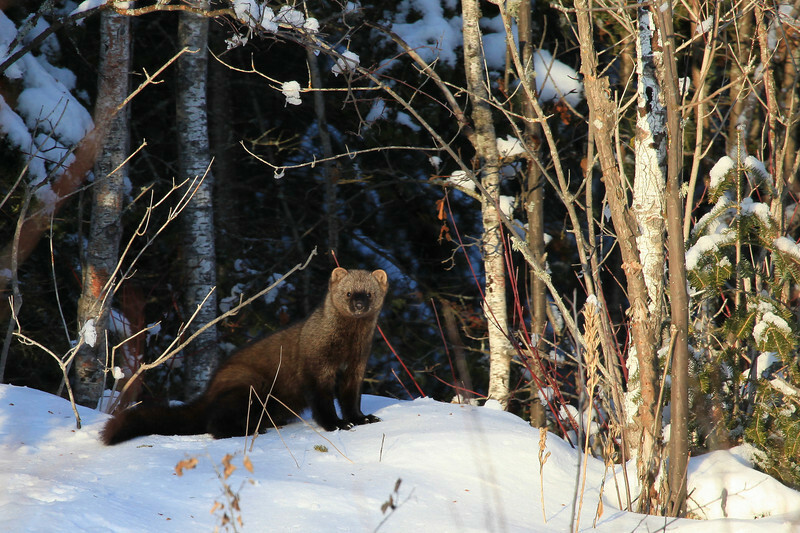 Sometimes luck shines on you... such as the day I went for a drive and saw this Fisher along the edge of the forest. Not a very common animal to spot in the wild, I feel very fortunate to have been able to capture an image such as this.